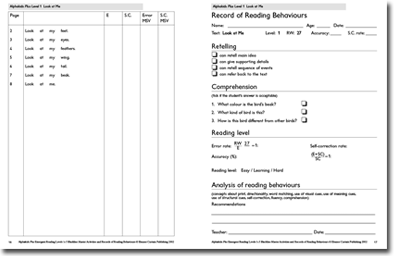 Records of Reading Behaviours are taken regularly in the early years of learning to read. These records are used to monitor progress and to determine each student’s learning level. A learning level is one where the student meets new learning challenges without being frustrated by a text that is too difficult. Teachers can select appropriate texts that are matched to each student’s learning level. Analysis of a student’s retelling of a text.